It's a strange categorization they have chosen, as shown by the fact that their first example of a "Franco-Belgian" comic (Blacksad), is actually Spanish. Styles are no longer as divided by national lines as they once were. it's awesome to see many of these, simply because they are overlooked. but the images appear to have been selected based on what was easily available via hi-rez google image search, not on striking quality of illos. "These three, and others like them, are aimed at the semi-literate working class"
oh come on. You either is or you ain't lit rit and if you call someone semi-literate you ain't on my team. typos most certainly excluded as a mark of literacy. Less "shining" than random, but, hey. Europe very often does BD really amazingly well. These aren't that. At all. Francisco Ibañez anthropomorphized his signature. Pro tip: look at the pretty covers, ignore the text, because whoever wrote this has no clue whatsoever about European comics. Those Dylan Dog covers are super great. Was thinking of FPPing this a while back, but it'll do here: I Love Comic Covers is a huge archive of pairs of comic covers that are related in some way (usually homages). Updated daily. The Dandy and Beano covers there might help foreigners understand Viz Comic a little better. Maybe. The lack of 2000 AD makes a mockery of this list. (I had no idea Dylan Dog was European. I blame that awful movie). Dandy and Beano I had heard of, and read as a kid, but the third UK one? Nope. Typo in title: Cor!! Should have TWO exclamation marks. I agree with Mezentian. No 2000AD, no Eagle, no Don Lawrence? Clearly the list was designed to reassure Americans that they're not missing anything. At the risk of being entirely self-serving, if anyone in here is really into Franco-Belgian or other European comics, and writing about them in English, I have a long-neglected* English-language bédé review site** that I keep meaning to get back to, but keep letting other things get in the way. If anyone wants to contribute to it, or even take the thing over, drop me a MeMail. *So much so that I notice that the recent WP upgrades have broken the design a bit. Oops. **The idea is that while my French comprehension is super good, my output is middling at best; there are a lot of other English fans of bédé out there with the same language profile as me, and I think they could be well-served by well-written articles and critiques on Eurocomics. Bananaman saves the Royal Wedding! Yes! Also, well timed post with it being Free Comics Day and all! I learnt to read rapidly by myself because Mom refused to read out Dad's weekly Dandy and Beano to me. She preferred to read out loud from the daily newspaper. Yeah, it's a bit weird - nice to see The Dandy et al get a mention though. I really should read some of those Edgar P Jacobs books sometime. No Enki Bilal? That's a thing that has to be fixed ASAP. I know it means "I ... Vampire!" but "Yo ... vampiro!" sounds awesome. It's as if some urban youth, off of the cover page, is calling to the vampire on the cover. I like those Blacksad covers enough that I immediately went to Wikipedia when I saw the first image and read all about Blacksad. I went through about a dozen different but intense emotions reading the wiki, before I realized that in five minutes I had completely spoiled the whole thing for myself, and read the entire synopsis of the Blacksad books. I was all set to go buy the first comic books of my life, and the goddamn free and open internet ruined it for me. I have just learned a valuable lesson from broadway bill and as such, have ordered Blacksad from Amazon with no further investigation. I was all set to go buy the first comic books of my life, and the goddamn free and open internet ruined it for me. Unless there were images of the way he draws blacksad's jaw, no, it didn't. Oh come on Broadway Bill. You knew that Rosebud is Kane's sleigh but there was still something worth seeing in "Citizen Kane". The devil is in the details. If "Blacksad" sounds fascinating in a few kilobytes of Wikipedia spoilers, imagine how awesome everything that got left out will be. 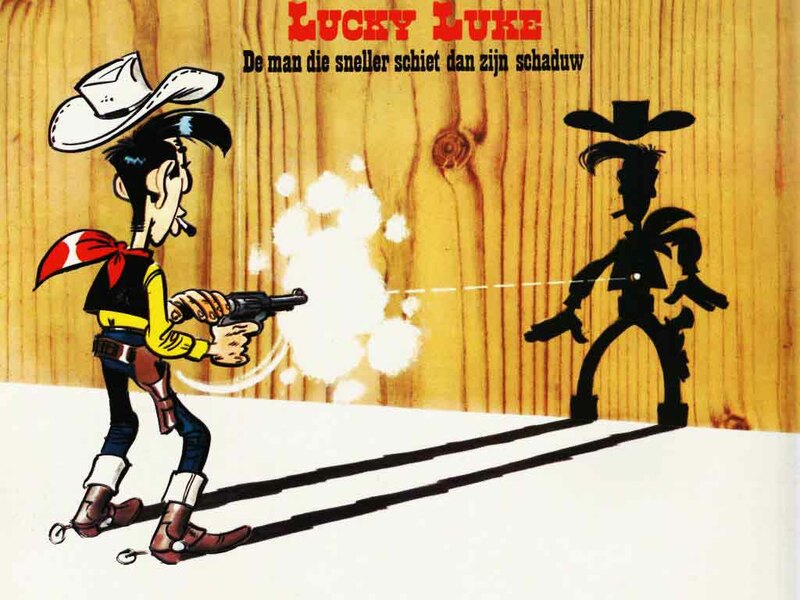 Adding an old fave into the mix, Lucky Luke (image from Cover Browser), that Belgian cowboy, who shoots faster than his shadow. Klondike. They're ... strange. Artwise it's in the same style as Herge of course, what Joost Swarte would later dub the clear line (ligne claire/klare lijn) but without any of the humour of Tintin . The stories are decent enough adventure tales, incredibly text heavy, even more so than Tintin and weirdly old fashioned; most written between 1947 and 1960, but they feel like they were written before the war. Crivvens! Have ye no heard of The Broons? Have a wee peek. Dinnae mind the words, ye'll get used tae them soon enough, and it's a richt bonny sound tae hear. Crivvens! Have ye no heard of The Broons? I was going to mention the Broons. But the last strip I read saw Maw trying to find a tuppence for the gas meter. It wasn't as if she had no money, she just didn't have a tuppence! I'll forgive the list's mistake as it reminded me to check out Blacksad. I wish there was some commentary or side-by-side contrast with comparable American covers or something. I can only recommend Blacksad: clever storylines, really good art. Edgar P. Jacobs is good, pulpy fun. And yes, more reminiscent of 1920s and 30s fiction than of anything else. This said, among his works, I'd recommend above all "The Yellow M", with its Hitchcockesque intrigue. 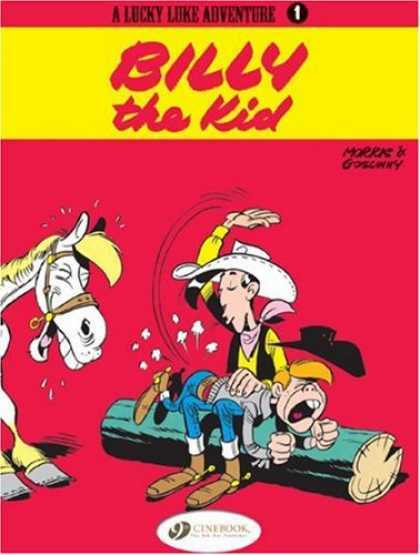 Now, the really big author missing from the list is Franquin. This is all the more galling since the list includes Francisco Ibáñez, who copied him pretty unashamedly (including the idea of doing silly things with his signature). Best graphic novel I've read in years. Amazing characterization and backgrounds so rich you could get lost in. I picked up a collection of Asterix comic strips from the 1960s -90s yesterday. Which reminds me, why weren't Goscinny and Uderzo mentioned in this FPP? huh?